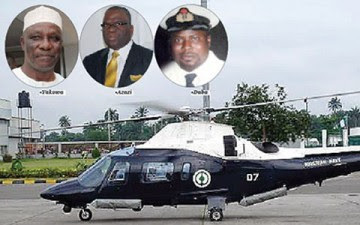 It was a harvest of tragedy on Saturday as Governor Patrick Yakowa of Kaduna State, the immediate national security adviser, Gen. Owoye Azazi, and four others were killed in a military helicopter crash at Okoroba Village in Ogbia Local Government Area of Bayelsa State. Others involved in the accident were Yakowa’s Special Adviser, Dauda Tsoho; Azazi’s bodyguard, Warrant Officer Mohammed Kamal and two Naval pilots, Commander Murtala Mohammed Daba and Lt. Adeyemi Sowole. The victims were returning to Port Harcourt after they attended the funeral ceremony of late Mr. Tamunoobebara Douglas, the father of the Presidential Adviser on Research, Documentation and Strategy, Mr. Oronto Douglas, when the incident happened. They were said to have been badly burnt and only identified by the shreds of their clothes. Azazi and Yakowa’s mobile phones rang out continually without any response when several calls were put across to them by some top government officials. Our correspondent gathered that the naval helicopter was heading for Port Harcourt, Rivers State, but developed a fault and crashed in the village, which also shares a boundary with Nembe Local Government Area. The Director of Information of the Nigerian Navy, Commodore Kabir Aliyu, confirmed that a Nigerian Navy helicopter was involved in the crash which occurred around 3:30pm. Aliyu who was silent on the identities of those involved in the crash said a rescue operation comprising personnel of the Joint Task Force, Operation Pulo Shield, the Navy, the Nigerian Air Force and the National Emergency Management Agency, were at work in Bayelsa. Our correspondent further gathered that the former Managing Director, Niger Delta Development Commission, Mr. Timi Alaibe, narrowly escaped the crash. A police source who pleaded anonymity said he was scheduled to board the helicopter but that there was a last minute change in the schedule. The source said, “Two helicopters took off at the same time. After sometime, we saw the one behind us wobbling and nosediving into the swamp. “The helicopter took off and was already stabilised on air. It had gained balance and started flying but unfortunately it came crashing. Around 7pm on Saturday, NEMA said it had activated its search and rescue team. “NEMA has activated its search and rescue team in collaboration with other response agencies at the crash site,” Yushau Shuaib of NEMA headquarters was quoted as saying. The Police Public Relations Officer, Bayelsa State, Mr. Fidelis Odunna, confirmed the incident. The Secretary to the Kaduna State government, Mr. Lawal Abdullahi on Saturday night also confirmed Yakowa’s death. The air crash came barely two months after the Governor of Taraba State, Mr. Danbaba Suntai, was critically injured in a similar crash in Adamawa State with his two aides.